We usually have a roast goose for Christmas dinner. Not this year, though. While we did do some slaughtering of some geese and a duck, the geese just weren’t up to our standard, really not worth plucking even, as we discovered about halfway through the job. These were the geese that a neighbor had asked us to take, that we kept separate from our flock because they really were mean and nasty. But while they were well fed, I’m not sure if it was the difference in breed or what, but they were scrawny bony things. Oh well. I’m making stock instead. 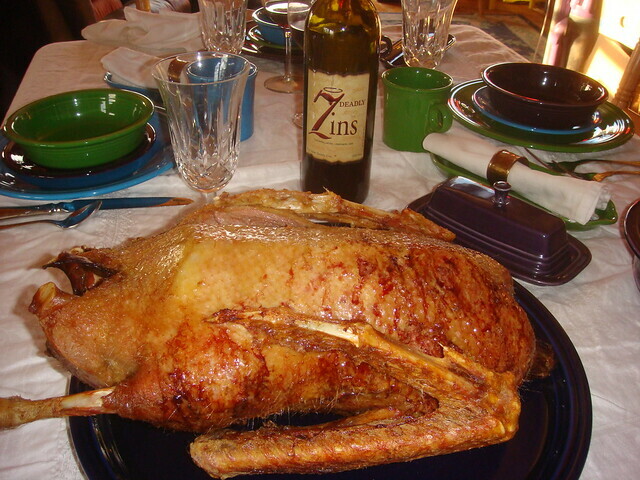 Meanwhile, I’ll remember roast goose from Christmas past and hope for one as good next year. Merry Christmas from all the gang.